Morning baseline of daily energy. Future energy level predictions (%). Personalized recommendations based on lifestyle. Energy is the foundation for everyday living. Productivity from the workplace to lifestyle—sleep, nutrition, fitness, social interactions—are dependant on sufficient energy levels required for each activity . Various generalized interventions have been proposed to address energy levels, but currently no method has proposed a personal approach using daily schedules/habits as determinants for energy. 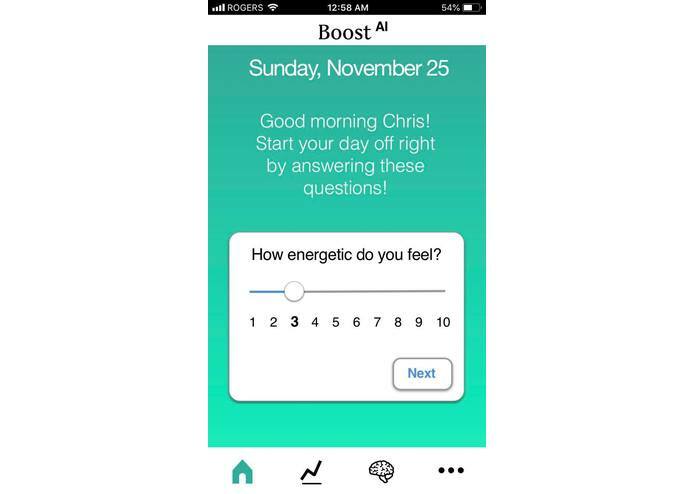 Boost AI is an iOS application that uses machine learning to predict energy levels based on daily habits. 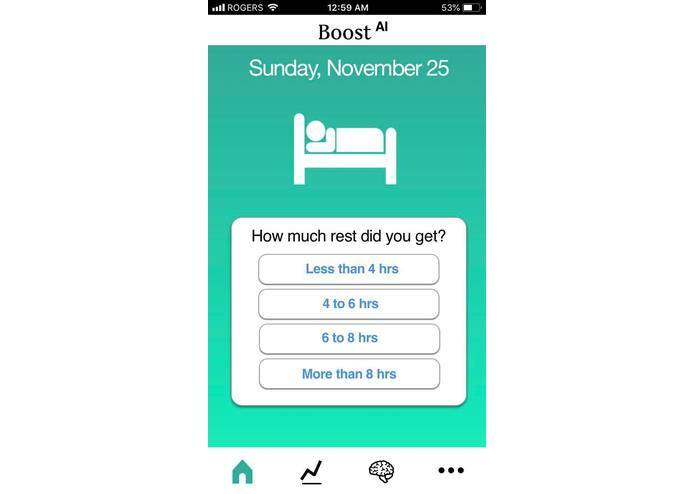 Simple and user-specific questions on sleep schedule, diet, fitness, social interaction, and current energy level will be used as determinants to predict future energy level. 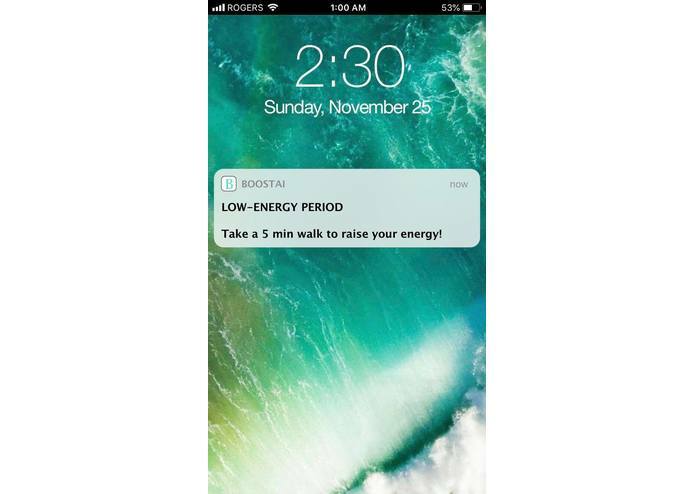 Notifications will give the user personalized recommendations to increase energy throughout the day. 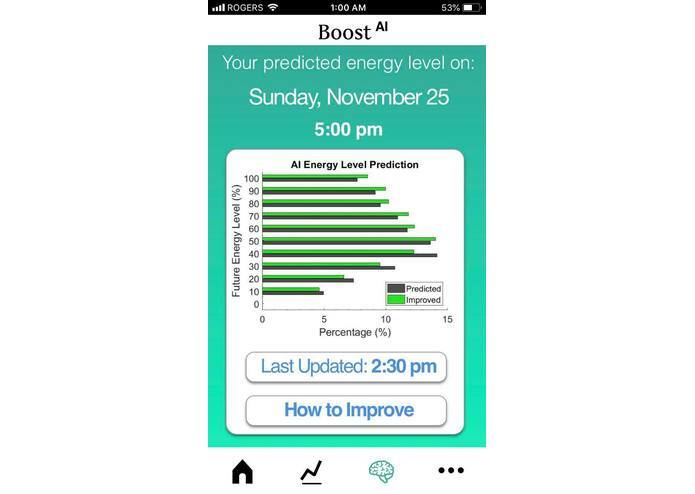 Boost AI allows you to visualize your energy trends over time, including predictions for personalized intervention based on your own lifestyle. We used MATLAB and TensorFlow for our machine learning framework. The current backend utilizes a support vector machine that is trained on simulated data, based on a subject's "typical" week, with relevant data-augmentation. The linear support vector machine is continually trained with each new user input, and each prediction is based on a moving window, as well as historical daily trends. We have further trained an artificial neural network to make these same predictions, using tensorflow with a keras wrapper. 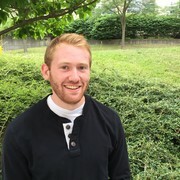 In the future this neural network model will be used to allow for an individual to get accurate predictions with their first use by applying a network trained on a large and diverse set of individuals, then continually fine tuning their personal network to have the best predictions and accurate trends for them. We used Sketch to visualize our iOS application prototype. Although we come from the healthcare field, we were limited in domain knowledge in human energy and productivity. We did research on each parameter that is determinant to energy levels. Boost AI is strongly translatable to improving energy in everyday life. We’re proud of the difference it can make to the every day lives of our users. 1) Workspace. Boost AI can be optimized in the workplace by implementing the application into workspace specific softwares. We predict that Boost AI will "boost" energy with specific individual interventions for improved productivity and output. 2) Healthcare. Boost AI can be use health based data such as biometric markers and researched questionnaires to predict energy. The data and trends can be used for clinical-driven, intervention and improvements, as well as personal use. Arnetz, BB., Broadbridge, CL., Ghosh, S. (2014) Longitudinal determinants of energy levels in knowledge workers. Journal of Occupational Environmental Medicine.